By Jennifer Bardsley in Spelling on January 17, 2014 . Jennifer, I just love your blog. I just “discovered” it yesterday while researching afterschooling on the WTM forums. I am a former public school teacher as well and am constantly trying to marry how I was trained to teach with the wonderful new-to-me information I’ve learned while reading about homeschooling these past few years. My oldest is being schooled via a virtual academy this year and my middle two attend our local public school. My youngest is 3. I would love to homeschool full time but am an afterschooler since I intend to return to some form of paid teaching with a focus on early reading instruction. Anyhow, currently at home I am using the Logic of English curriculum with my older two as well as their Foundations program with my third child. But I have been very curious about AAS and AAR. I only discovered those after finding LOE so I didn’t want to make the monetary investment. One point I am very curious about is what is the real difference between their spelling and reading programs? If you teach your children as you have in the preschool years, do you need both programs? I have read the material on their website but since you and I come from very similar educational backgrounds, I am interested in your take on the two programs. I only have a couple of the AAR books and I mainly bought them because I was curious. I think AAR would be a good program for somebody who wanted their hand held the entire time teaching kids to read. But my personal view is that really isn’t necessary. I have a whole bunch of ideas that people could use that are completely free, that would also teach young children to read. With spelling, it’s different. AAS really has something special. For poor spellers like me, there’s no way I could recreate that at home. Sadly, it is pretty expensive. 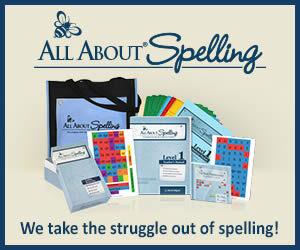 It also doesn’t work in a whole-class setting, which is what makes it so perfect for Afterschooling or homeschooling.